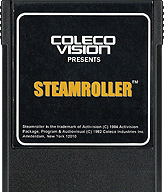 ColecoVision.dk presents: Steamroller © 1984 by: Activision Inc.
ColecoVision Manual # and Manufacturer: None, Intellivision Productions U.S.A.
ColecoVision Box # and Manufacturer: None, Intellivision Productions U.S.A. Pause Feature: Yes, press " 0 "
Play against computer or against another player head-to-head. Potholes into Manholes, and if one of those smiling Beachballs falls into a Manhole, it bounces out a killer Beachbomb !. So fix Potholes, pop Beachballs and watch out for that other Steamroller !. XName: Tom Duncan. XName: XName: Ole Nielsen. 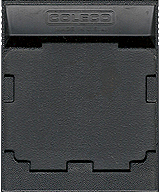 ColecoVision.dk Game # 127, Steamroller is last updated: December 10, 2017.